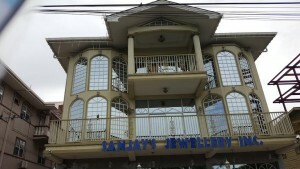 Police were Sunday investigating an alleged robbery committed at Sanjay’s Jewellery Store on Sheriff Street, Campbelville , Georgetown. The owner, Bishnarine ‘Sanjay’ Persaud was not immediately available to give an account of the incident as he was said to be speaking with investigators inside the building. However, Divisional Police Commander, Assistant Commissioner Clifton Hicken told Demerara Waves Online News that crime sleuths were probing a report that at about 11 O’clock Saturday night four men attacked Persaud while he was about to enter his premises. They forced him inside and eventually carted off two safes containing undisclosed quantities of cash and jewellery, Hicken said police were told. The Divisional Commander said no shots were fired. He said police have since dusted the relevant parts of the building for fingerprints and would be reviewing surveillance footage. Several security surveillance cameras have been installed around the heavily fortified building. Persaud was several months ago convicted and jailed for causing death by dangerous driving. He is on bail pending the hearing of an appeal.